"Can you buy heat resistant ombre hair braiding extensions?" Heat resistant ombre hair braiding extensions are usually made from kanekalon fibres and are great for hot water curl setting braided hair extensions. Braid hair extensions that are heat resistant will always say so on the packaging; the rule of thumb is that if the packaging does not mention that the hair is heat resistant then assume that it is not. If you are unsure, you can place a small amount of the hair in a coffee mug and add boiling water from a kettle - synthetic hair fibres that are heat resistant will not react to the boiling water - if the hair clumps together, hardens or coils then it's not heat resistant. "Are ombre braid hair extensions available in human hair as well as bulk synthetic hair and if they are, should I buy Remy or non-Remy hair?" Ombre braid hair extensions are available as human hair braid extensions as well synthetic fibre hair extensions for braiding. If you're choosing human hair braid extensions and you're intention is to braid the hair all the way to the ends then you can get away with using non-Remy hair as the tangling issue is mitigated by the fact that once braided, the hair will not be combed. That said however, if the non-Remy hair has been dyed and it doesn't have cuticles, you will notice that the colour may fade and it may become dry so keep it hydrated with a good water-base moisturized. Even though you won't be combing the hair, you will be wearing the hair and the last thing you want is to have spent the time and money achieving a great look only for it to look faded and dry within a few weeks. If you're choosing human hair braiding extensions that are only going to be braided part of the way (just beyond the length of your own growth hair) then the advice above applies. As we said before, you really don't want to be in a position of spending a significant amount of money on human hair, the hours having it braided for it to look less than great within a few weeks - take care of your braided hair extensions and they'll take care of how you look. "Should I buy a synthetic ombre braid hair extensions or human hair braid extensions?" 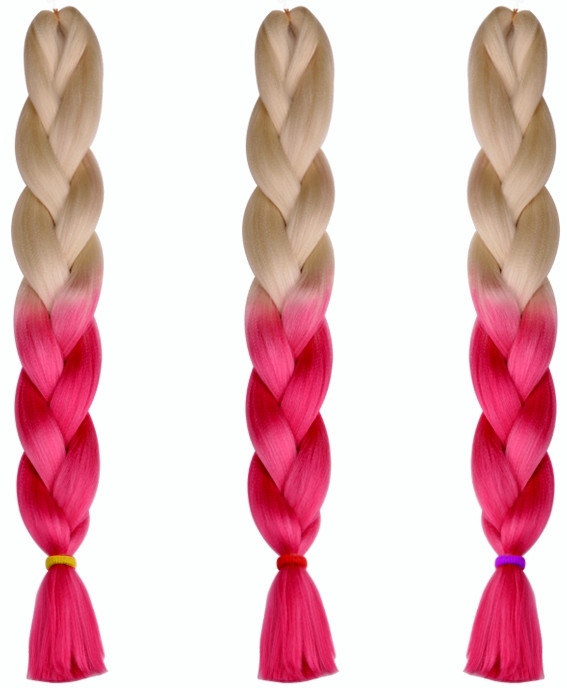 Much like the article about ombre lace wigs, sometimes it's better to choose a synthetic fibres for your ombre braided hair extensions if you're going for bright versions of colours such as hot pink or bright red. 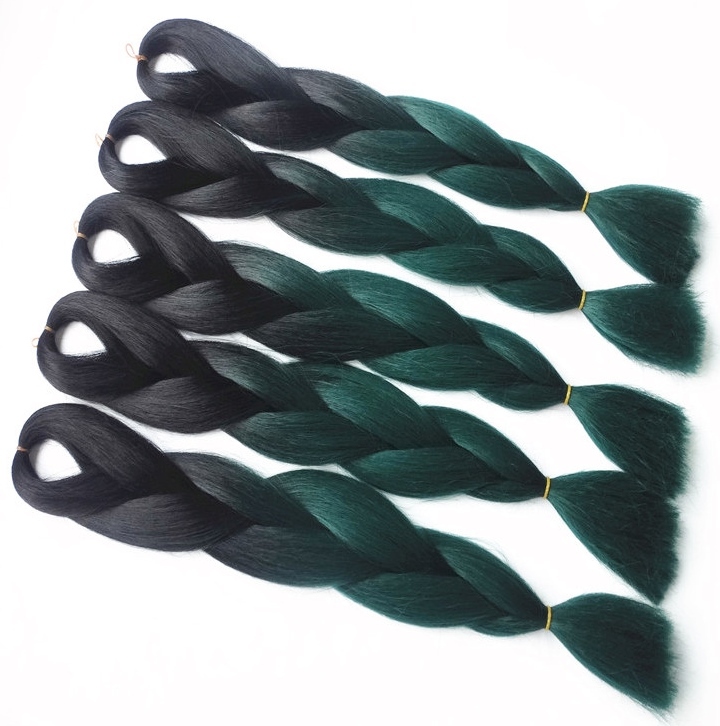 Firstly synthetic braided hair extensions are significantly more affordable and furthermore, the colour won't fade in the way that it will with human hair extensions for braiding (a little point to note is that all dyed human hair fades over time even if the dye is classified as permanent). "Do ombre braided hair extensions only come with dark roots and lighter ends, or can you get them the other way round?" It seems to be a bit of a misconception that ombre hair always means darker roots and lighter ends; in fact the word ombré has its origin in French as a past participle of ombrer meaning 'to shade'. So ombre hair colour is really about shading whether from light to dark or dark to light (and before we get a ton of messages; yes, typically or rather traditionally it meant shading from light to dark). 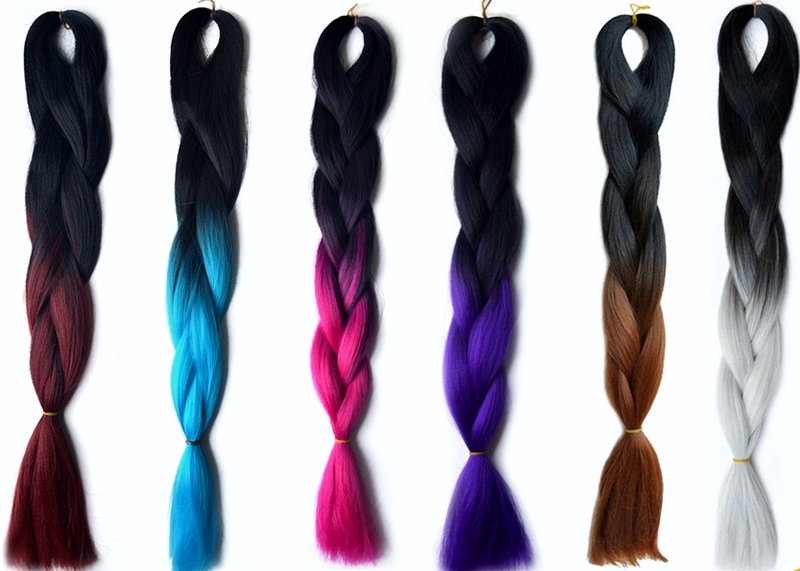 Out there in internet space, the most common forms of ombre braided hair extensions go from dark to light, but you can find ombre braided hair extensions that go from light to dark as well as those that have more than two colours.